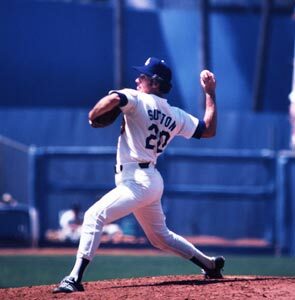 you can see don sutton arch is back a lot. I throw like that and i wouldlike to know if it puts extra pressure somewhere in your body that might or might not be good and i wouldlike to know if it’s good or bad for a pitcher. chris o-leary, you did a pitching analysis of don sutton where you talk briefly about is back but you didn’t tell if it was actually a good or a bad thing. I don’t think it’s a problem. Many guys (e.g. Juan Marichal) have done that over the years but few have had back problems. Super-submarining ala Chad Bradford is the only thing that I’m worried about in terms of back problems. It is bad for the back and good for pitching. Most pitchers don’t end up with career threatening back problems so it is an acceptable risk for most. I agree that I wouldn’t do this if you have a history of back problems in your family.